Bezymianny (Russia). KVERT reported that after an explosive eruption on 1 June two bright thermal anomalies on the flanks were seen in satellite imagery during 1-2 June, possibly from pyroclastic flow deposits. On 4 June KVERT noted that strong gas-and-steam emissions continued to rise from the lava dome. The Aviation Colour Code level was lowered to Yellow. Cleveland (Alaska, USA). AVO reported that a weak thermal anomaly was detected in satellite imagery on 2 June. Cloud cover mostly prevented observations during 3-8 June. The Volcano Alert Level remained at Advisory and the Aviation Colour Code remained at Yellow. Pacaya (Guatemala). INSIVUMEH reported that on 3 June Strombolian activity ejected material 200 m into the air. During 5-6 June no explosions or ash emissions were noted and seismic energy remained stable. Bluish-white plumes rose 700 m and drifted W. On 7 June an explosion ejected ash 100 m above the crater resulting in an ash plume that drifted 2 km NW. Blue-and-white plumes continued to rise from MacKenney cone. Multiple lava flows remained active and had travelled as far as 3.5 km by 6 June. Taal (Philippines). On 8 June PHIVOLCS raised the Alert Level to 2 (scale is 0-5, with 0 = No Alert status) due to changes in several monitored parameters starting in late April. Since 26 April the number of earthquakes per day continued to increase, as did the magnitude. Low-frequency volcanic earthquakes were detected on 2 June and during the previous day high-frequency earthquakes were noted. In addition to the increased seismicity the temperature of the Main Crater Lake increased from 32 degrees Celsius on 11 May to 34 degrees Celsius on 24 May. Steaming from the N and NE sides of Main Crater occasionally intensified. Deformation data had shown slight inflation since 2004; measurements taken at the SE side on 7 June showed further inflation by 3 mm. Tiatia (Russia). SVERT reported that a thermal anomaly was detected by satellite on 31 May. This volcano does not have a seismic network; satellite image observations are the primary tool for monitoring many of the Kurile Islands volcanoes. Tungurahua (Ecuador). Although storm clouds often prevented observations of the summit area during 1-8 June, steam-and-ash plumes generated by explosions were sometimes seen and rose to 6-8 km a.s.l. Larger explosions occasionally produced ash plumes that rose as high as 9 km a.s.l. Daily reports of ashfall came from multiple areas within about 8 km NW, W and SW. Explosions ejected blocks (occasionally incandescent) almost daily as high as 1 km above the crater rim. The blocks that fell outside the crater descended the flanks a maximum distance of 2 km. Noises resembling ‘cannon shots’ associated with explosions were often followed by vibrating windows and doors in local areas; on 6 June large windows vibrated at Tungurahua Observatory (OVT) in Guadalupe, 11 km N. On 2 June a pyroclastic flow traveled 1.5 km down the NW flank. During 5-7 June ashfall was noted in areas farther away, including at OVT and Cevallos, 23 km NW. Explosions on 7 and 8 June generated ash plumes that rose to 9-10 km a.s.l. and drifted W. On 7 June another small pyroclastic flow traveled 1.5 km down the NW flank. Ulawun (Papua New Guinea). RVO reported that during 2-7 June occasional low roaring or rumbling noises were heard daily in areas on the ESE, SE and S flanks. During 2-5 June white vapour plumes rose 800-900 m. Very fine ash particles fell in Ulamona about 10 km NW on 3 June and some grey emissions rose from the volcano on 5 June. Emissions during 6-9 June were white and light grey, and continued to rise no higher than 900 m. Fluctuating incandescence from the crater was seen at night from the S side of the volcano. Ashfall was again reported in Ulamona on 8 June. Batu Tara (Indonesia). Based on analyses of satellite imagery, Darwin VAAC reported that during 2-7 June ash plumes rose to 2.4 km a.s.l. and drifted 20-65 km W, NW and N.
Dukono (Indonesia). Based on analyses of satellite imagery, Darwin VAAC reported that on 2 June an ash plume rose to 2.4 km a.s.l. and drifted 110 km NW. On 7 June a diffuse ash plume was seen drifting 110 km W at 3 km a.s.l. Eyjafjallajökull (Iceland). The Nordic Volcanological Center (NVC) at the Institute of Earth Sciences reported that on 2 June a white steam cloud from the summit caldera rose to 2.5 km a.s.l. Scientists visited the summit on 3 June and noted that the main crater remained active, though less so than during the previous visit on 27 May; steam rose 200-400 m above the crater rim. The next day cloud cover prevented observations. During 3-4 June remobilized ash drifted over a wide area of S and SW Iceland. Scientists noted increased tremor on 4 June and a black plume that rose to 4.5 km a.s.l. Considerable rumbling noises were reported from an area 10 km S. Tremor levels fluctuated during the next three days. Plumes that rose from the summit caldera were mostly white with occasional dark areas at the base following explosive activity. Plumes drifted SW during 4-5 June and S during 6-7 June at altitudes of 3-6 km a.s.l. A new crater was seen in the W part of the caldera at the site of the new explosive activity. Karymsky (Russia). KVERT reported that during 28 May-4 June seismic activity was above background levels, suggesting that possible ash plumes rose to 4 km a.s.l. Satellite imagery revealed a daily thermal anomaly over the volcano and ash plumes that drifted 30 km S on 1 June. The Aviation Colour Code level remained at Orange. Kilauea (Hawaii, USA). During 2-8 June HVO reported that activity continued from the summit and the east rift zone. At the summit, the level of the circulating, crusting and bubbling lava-pool surface remained mostly stable in the deep pit inset within the floor of Halema’uma’u crater; glow from the vent was visible. A plume from the vent drifted SW, dropping small amounts of ash and spatter downwind. At the east rift zone lava flows that broke out of the TEB lava-tube system at 580 m elevation built up rootless shields. Minor surface lava flows from the shields were active on the pali and the coastal plain. Lava stopped flowing into the ocean at the Ki entry some time during 2-3 June. The Pu’u ‘O’o’ web camera recorded a growing and circulating lava pond on the crater floor that on 5 June was an estimated 300 x 125 m in dimension. A small spattering cone was seen on the floor to the N of the pond. Kliuchevskoi (Russia). 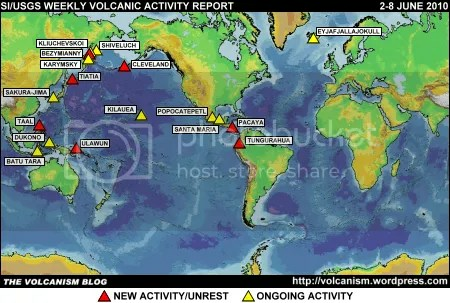 KVERT reported that during 28 May-4 June seismic activity was above background levels and Strombolian activity was seen. Gas-and-steam plumes occasionally containing a small amount of ash were also noted. Satellite imagery revealed a large daily thermal anomaly from the volcano, and ash plumes that drifted 40 km NW on 28 and 31 May. On 1 June an ash plume rose to 7.3 km a.s.l. The Aviation Colour Code level remained at Orange. Popocatépetl (Mexico). CENAPRED reported that during 2-3 and 7-8 June steam-and-gas emissions occasionally contained small amounts of ash. The seismic network detected a few periods of harmonic tremor. Steam-and-gas emissions continued during 4-7 June. On 8 June a moderate explosion generated an ash plume that rose to 8.4 km a.s.l. Sakura-jima (Japan). Based on information from JMA and pilot observations, Tokyo VAAC reported that on 3 June an eruption produced a plume that rose to 2.1-3.4 km a.s.l. and drifted W.
Santa María (Guatemala). On 4 June, INSIVUMEH reported that a 12-m-wide lahar descended Nima I river carrying blocks up to 60 cm in diameter. Tropical storm Agatha had brought abundant rain to the area. Shiveluch (Russia). KVERT reported that during 28 May-4 June seismic activity was above background levels, suggesting that possible ash plumes rose to 6.1 km a.s.l. Strong fumarolic activity was also noted and hot avalanches were seen at night. Ash plumes observed throughout the reporting period rose to 4.5 km a.s.l. Satellite imagery showed a large daily thermal anomaly. Gas-and-steam plumes seen in imagery drifted 30 km W on 29 May, and an ash cloud 20 by 6 km in dimension was detected about 15 km N on 31 May. The Aviation Colour Code level remained at Orange. 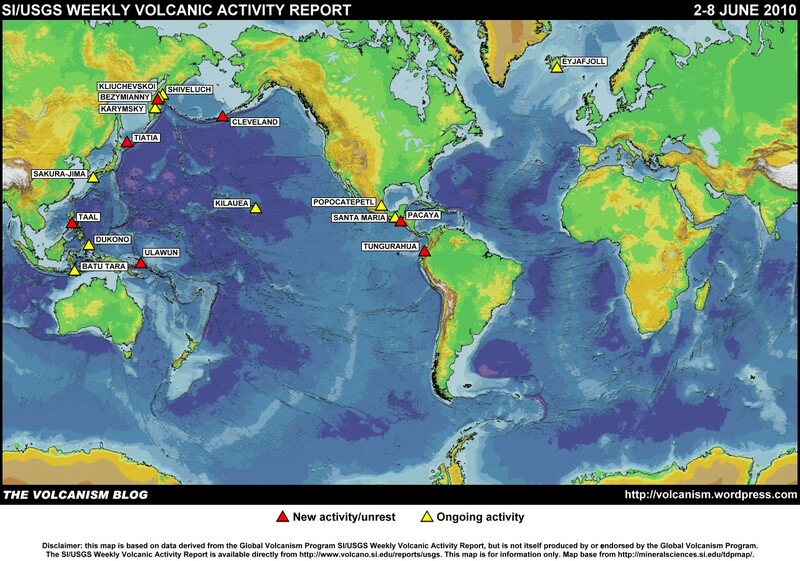 The foregoing is a summary of the Smithsonian Institution/United States Geological Survey Weekly Volcanic Activity Report covering 2-8 June 2010. It is provided for information only, and is based on but not a substitute for the full report, which comes with its own criteria and disclaimers. The map base is derived from the Smithsonian Institution/USGS/US Naval Research Laboratory This Dynamic Planet website.